Visit PHOENIX Process Equipment in Booth #40042 at the AGG1 Show in Indianapolis, IN February 12 -14, 2019 to see the unique and highly efficient dewatering design of our Bucket Wheel. The Bucket Wheel's innovative dewatering design provides high solids capacity up to +1700 STPH, sand recovery up to 99.5%, and handles multiple product streams simultaneously. It excels in dewatering, washing and sand recovery and is ideal for waste scavenger recovery. AGG1 will showcase the latest technologies and innovations from suppliers within the aggregates industry. 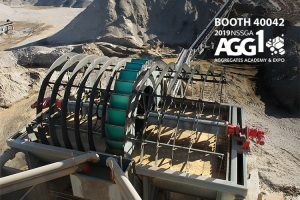 The latest in aggregates-related equipment, technology, products and services will be exhibited, while the exposition features industry-focused educational sessions. PHOENIX provides innovative and efficient technology for tailings dewatering, thickening, washing, classification, fines recovery, water recycling and water reuse for aggregate processing and additional markets.